Stage IIIB adenocarcinoma of the esophagus (2); drawing shows cancer in the esophagus and in the a) diaphragm, b) azygos vein, c) pleura, and d) sac around the heart. Also shown are the airway, lung, chest wall, rib, and aorta. 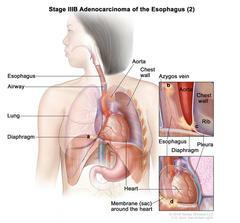 Stage IIIB adenocarcinoma of the esophagus (2). Cancer has spread into the diaphragm, pleura, sac around the heart, azygos vein, or peritoneum (not shown). Cancer may be found in 1 to 2 lymph nodes near the tumor.